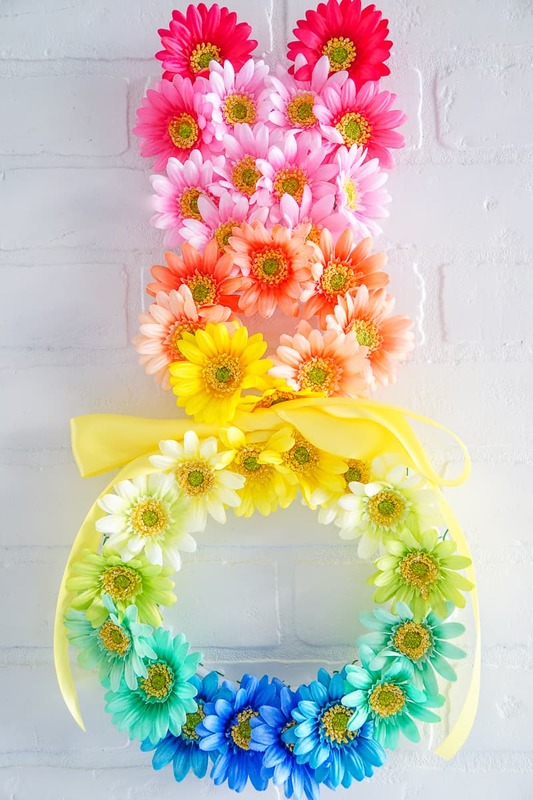 This Easter Bunny Wreath is the perfect DIY Easter wreath – The flowers are just what your Spring Door Hanger needs. Spring door hangs always make me think of Easter Bunny Wreaths. This Boxwood Bunny Door Hang has been hanging on my door the last few Springs and so I knew I was in need of another DIY Easter Wreath. This wreath combines my love of Easter, bunnies, and flowers into one Easter Door Hanger. Flowers wreaths and flower door hangs for Spring always brighten up a front door. 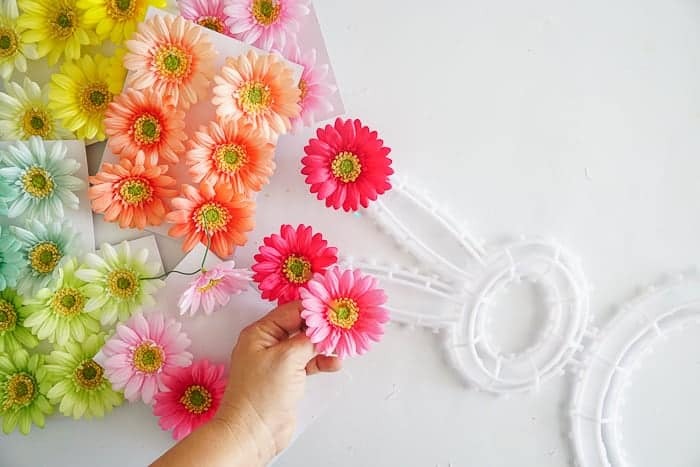 I have been working on a few projects with real flowers and while I love them all so much, there is some really fun flower crafts that are even better with artificial flowers. Bring on Spring! The part of this project that can be the trickiest is making a bunny form, or finding a form that will work for a project like this. 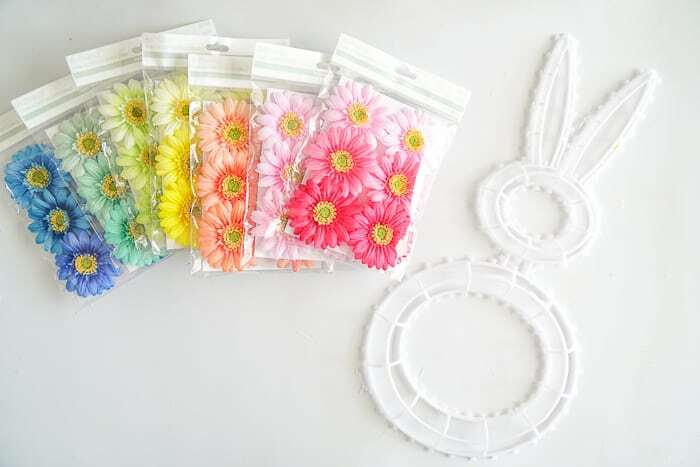 For more traditional DIY Easter Wreaths, there are lots of different round wreath forms throughout the craft supply stores, but other shapes, like a bunny, are not as easy to find or make. I made the bunny for this Easter Door Hanger out of wire. For this project I found this plastic bunny decoration. While this bunny form is plenty cute how it comes, the white plastic covering isn’t my jam. When I removed the outsite wrapping, I found a cute white plastic bunny form underneath. How to attach flowers to a wreath? It all depends on what flowers you are using and what your wreath or door hang looks like. 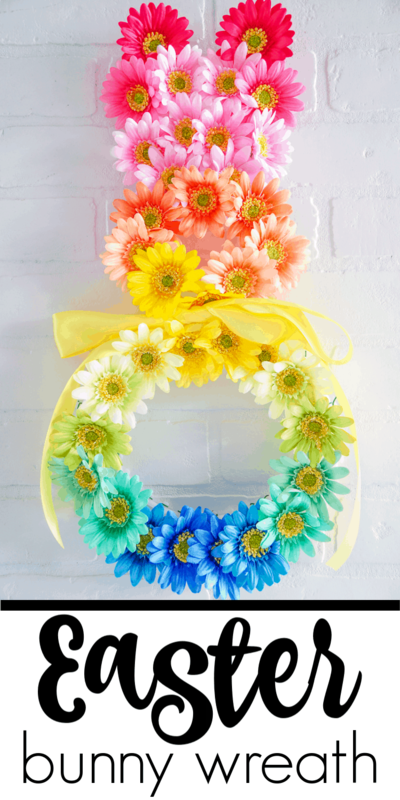 For traditional circular wreaths, there are many ways to attach flowers to them. 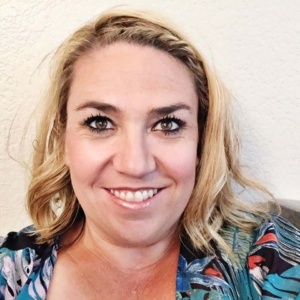 Using floral wire, the wire stem, and floral tape like we used in this DIY floral crown. 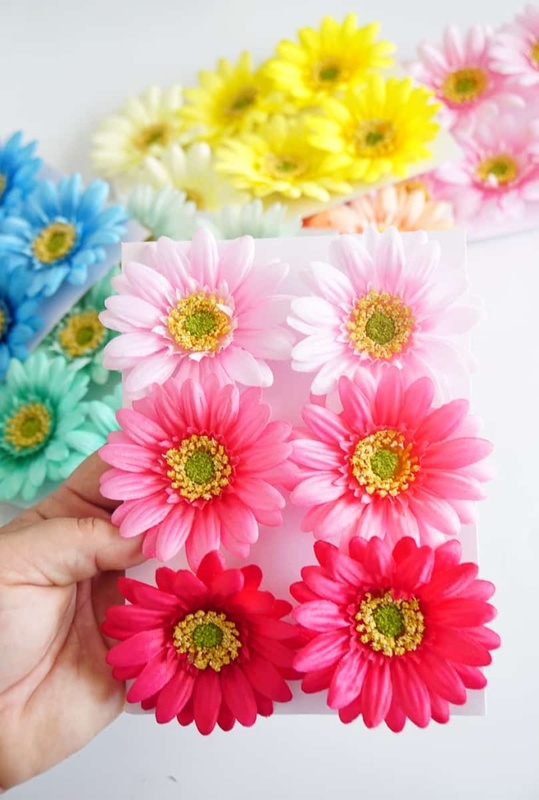 You can certainly attach the flowers to this wreath using similar methods, I think the fact that its a lighter plastic makes it easier to use flowers that come on wire like these sweet daisies. 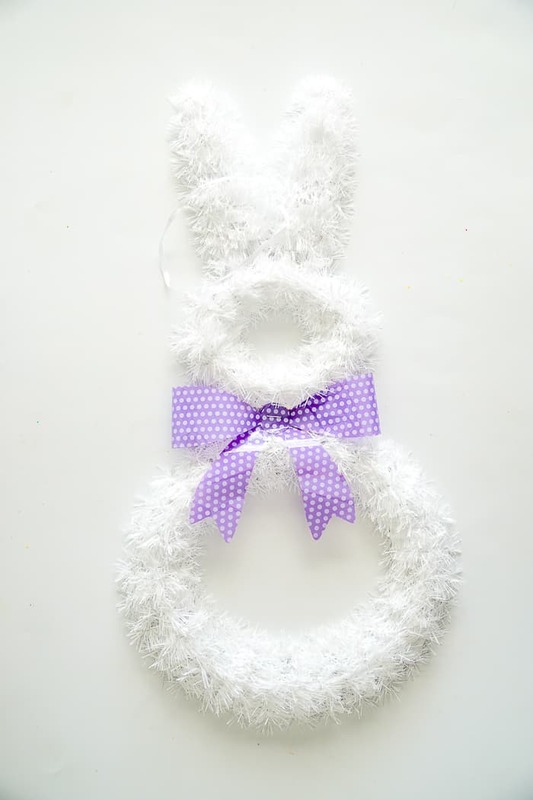 There are just a few simple supplies needed for this super pretty floral Easter bunny wreath. 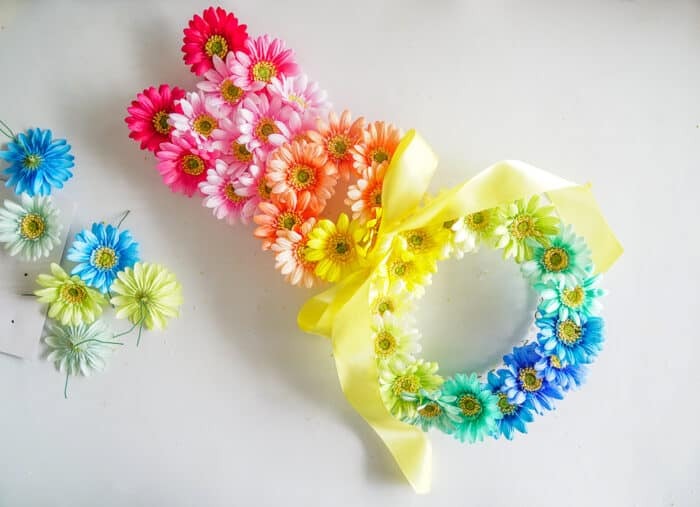 Simply attach the flowers along the outsides of the bunny ears and twist in place. I have a big puffy heart for the ombre flowers. You can see from this ombre bunny, that ombre is my jam. I love the idea of an ombre rainbow flower bunny. One tip I would suggest as you work your way down the bunny, twist the floral wire to the outside nodules will keep the flowers in place and not spin around the middle of the wreath. PIN IT TO YOUR KIDS CRAFTS BOARD ON PINTEREST!